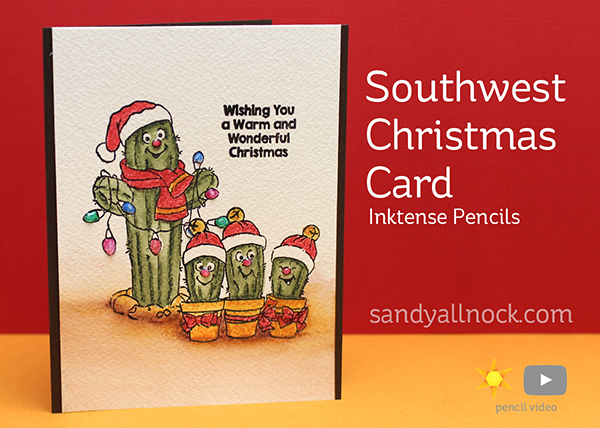 Ho ho ho – from the southwest! Or maybe TO the southwest. Some cute but prickly cactuses (cactii?) 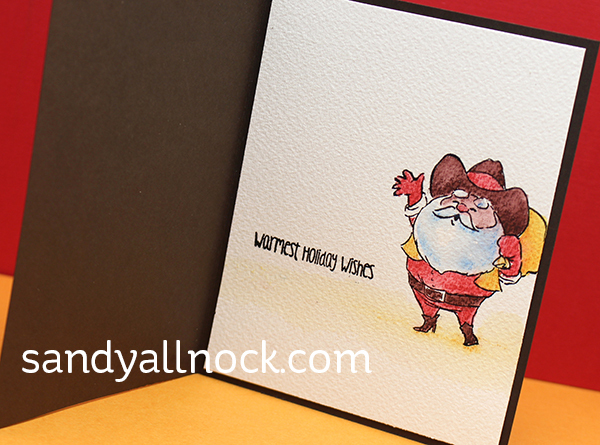 adorn the outside of this card – with a santa surprise inside! Watch the video below or click HERE to watch in HD on YouTube. Very sweet card Sandy. I just think it is adorable and the coloring and design, wonderful. Thanks for sharing your incredible talent with us. So cute, Sandy. Love all your tips and tricks. Love it! How do I get on your Christmas card list? I really love that wonderful card. Such adorable cacti. I’m going to need that set. Thanks for the great video….I learn so much from your videos. I almost go into a “trance”….they’re so mesmerizing. Thanks so much for sharing your talent. I LOVE it! I bought it! When I see these very “specialized” stamps, I usually check my (already too large!) collection to see if I can replicate the design before buying more. In this case, I’d decided to put Lawn Fawn Santa hats and faces on my MFT succulents … until I saw cowboy Santa. Then I ordered the new stamps, lol. 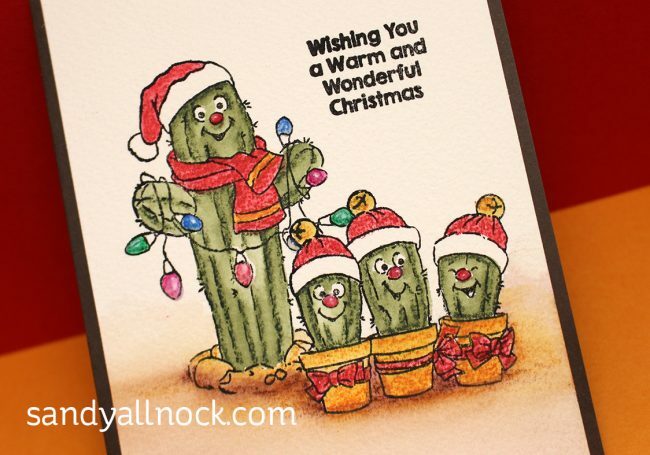 I live in a very cowboy place, and I have very cowboy business partners, and you just designed the very special cards I’ll send them this Christmas! I love and learn from your work. Please continue the bible journaling, By which I am inspired, and through which I praise. Thanks! Oh my goodness, so cute Sandy! I could literally sit and watch you color all day. I love to wait for that moment when the picture just jumps out to you while you have been watching all the shading. You have such a talent! I live in south Texas and have never seen cacti this cute! Thanks for bringing a smile to my face! Im so glad you did this set. Ive been wanting this set since I first saw it in the CHA AI video. I love how the Inktense pencils are so full of color and leave a little texture. Worked great for the cacti. TY for sharing tips while you color and watetcolor with these pencils-always helpful. So sweet and fun! Thanks for showing us the movement with the pencils! Wonderful. I may need this set. I have used my other w/c pencils on cards, but haven’t used my Inktense. Don’t know why, but I will definitely get them out! I love, love, love the way they play! Thanks for reminding me. You’re having an effect on me, lady – I find myself more and more willing to try other media to color my cards – and other stamp makers, and I am finding that practice really DOES make a difference, and I’m having a lot more fun! Thank you for that continual nudge – keep it up!